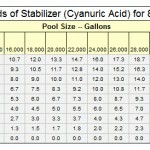 In order to figure out proper doses of chemicals for your pool, you need to determine how many gallons of water it holds. To do that, you need to know four different numbers. To determine the average depth in a pool where the bottom slopes, measure the shallow end and the deep end depth. Add them together and divide by two (2). How Often Should I Run And Clean My Filter? Why Does Algae Grow In My Pool? Hypoluxo, Juno Beach, Jupiter, Lake Worth, Lantana, Manalapan, Loxahatchee, North Palm Beach, Palm Beach, Palm Beach Gardens, Palm Beach Shores, Riviera Beach, Royal Palm Beach, Tequesta, Wellington, and West Palm Beach.